Samsung's hopes of ending years of acrimony over whether its computer chip factories caused cancer have hit a hitch: some sickened workers and their families say they'll never accept its highly conditional offer of financial assistance. 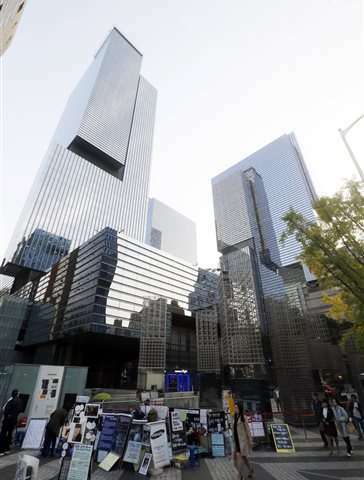 As recently as the middle of last year, it seemed the South Korean consumer electronics giant was ready to come to terms with critics of its workplace safety. While still not conceding a link between the chemicals used in its semiconductor factories and cancer, it apologized and promised financial help for sick workers. The statement was a welcome if incomplete victory for families and activists who have battled for years to hold the company to account. The shift came as Samsung Electronics prepared for leadership of the company to pass to Lee Jae-yong, the son of its ailing chairman. The plight of former workers was also attracting media scrutiny in Europe and in the U.S., both important markets for Samsung's smartphones and other products. Another sign of progress came in December 2014 when Samsung, workers and their families agreed that a three-member panel of experts would mediate. But an ugly rift has now opened between Samsung and the main advocacy group for sick workers, Banolim. At issue is Samsung's rejection of the mediator's recommendations that an independent organization be established to oversee compensation and monitor safety and preventive measures at its factories. "If there are no preventive measures, workers will continue to get rare diseases. 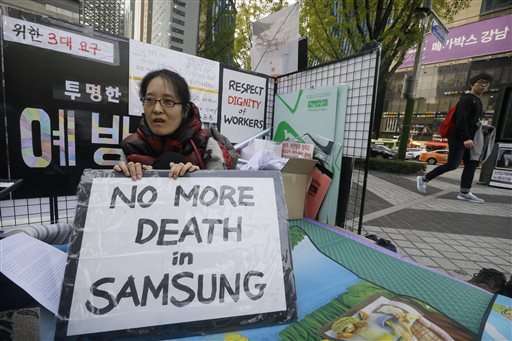 And every time there is a sick worker, Samsung will just compensate," said Hwang Sang-gi, a founding member of Banolim. He is among the people who say they won't apply for Samsung's financial aid, seeing it as a distraction from the more important issue of prevention. 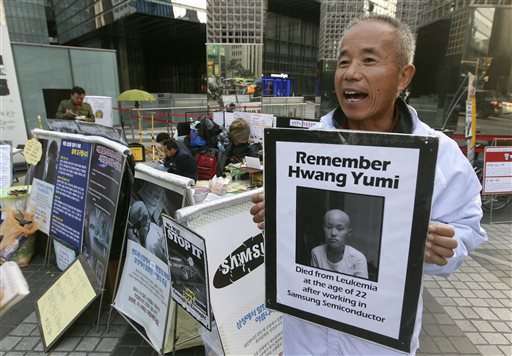 Hwang lost his 22-year-old daughter Yu-mi to leukemia in 2007 after she worked dipping silicon wafers in chemicals at Samsung's Giheung factory, south of Seoul. Her death galvanized concern about conditions at Samsung factories and South Korea's semiconductor industry in general. Hwang's struggle to find out why his daughter died was the basis of a popular movie released last year. More than 200 people who worked at Samsung's semiconductor and LCD factories and suffered chronic illnesses have contacted or sought help from Banolim. Of them, 72 have died. Many had cancers such as leukemia and were aged in their 20s or 30s. The oldest cases date to the 1980s but most are from the 1990s and 2000s. South Korea has long praised the economic benefits of the semiconductor industry, which helped the country become among the richest in Asia. But it only recently began discussing the human and economic costs of workers who became ill after or while laboring on chip manufacturing lines, which use hundreds of chemicals that have not always been disclosed or monitored. Only in 2012 did Samsung begin monitoring the level of benzene in the air at its factories. The carcinogen could be released as a by-product from other substances. A one-year evaluation of six South Korean semiconductor companies including Samsung, released in 2008, reported a statistically significant increase in non-Hodgkin's lymphoma among female workers. The study by the government-run Occupational Safety and Health Research Institute said there was no statistically meaningful increase in leukemia. Samsung said the results didn't stem from its workplaces but no factory specific data has been released. The institute began a 10-year study in 2008. 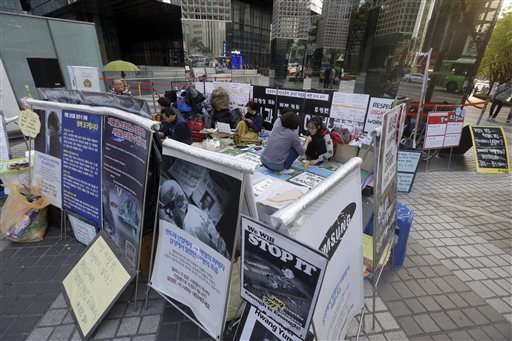 In this Oct. 23, 2015 photo, former Samsung worker Han Hye-kyung, denounces the company's response in its latest negotiations with sick workers, during a protest outside Samsung buildings in Seoul, South Korea. Han became disabled after going through a surgery to remove a brain tumor that she and her lawyers believe to be caused by exposure to chemicals at Samsung's factory, south of Seoul. Samsung's hopes of ending years of acrimony and bad publicity over whether its semiconductor factories caused cancer have hit a hitch: some sickened workers and their families say they'll never accept its highly conditional offer of financial assistance. (AP Photo/Ahn Young-joon). Samsung rejected the mediator's proposals because establishing a public entity takes time, which only "prolongs the pain," said Baik Sooha, a vice president at Samsung. "One of the important ways to see the resolution of this problem is to see how many people have agreed to settle," he said. Samsung says it will cover medical fees and some income for workers with any of 26 diseases. So far, 120 people have applied for compensation. Only a few are known to be from the 200-plus cases tracked by Banolim. Among those applying, 59 received an undisclosed amount of money and agreed not to pursue legal action against Samsung. Another nine will soon settle as well. The remaining 52 either did not meet the Samsung's criteria for settlement or are still undergoing the settlement process. Samsung would not specify how many were rejected. Meanwhile, South Korea's second-largest semiconductor company SK Hynix has opened its oldest chip factories, chemical use and employee health data to external investigators. Last month it accepted their recommendations to provide financial help to all sickened employees, including those suffering from miscarriage and infertility, two categories that Samsung doesn't consider for financial assistance. U.N. human rights rapporteur Baskut Tuncak said in October he has "grave concern" about Samsung's compensation plan, which has become cloaked in secrecy. It appeared that victims' need for health care and other expenses was being used to "circumvent the prospects of increased scrutiny into whether businesses are taking steps to prevent reoccurrence" of health risks, he said. Banolim has faced an onslaught of criticism in South Korea's media that began not long after Samsung indicated it was unhappy with the mediator's proposals. Some news articles portrayed the advocacy group as a threat to the country's semiconductor business at a time when Chinese firms are catching up to South Korean companies. Others said the campaigners wanted the oversight body established so they could get jobs. Samsung said it has never encouraged any South Korean media to publish stories attacking the advocacy group. The conglomerate is the country's biggest advertiser. "When I look at what media say, a lot of times I get so angry," said Son Sung-bae, 26, whose father died in 2012. He was diagnosed with leukemia working at a contractor that maintained equipment at Samsung's semiconductor lines. Samsung's financial assistance is available to contractors and their families but Son won't apply for it. "There are a lot of families who think the way Samsung compensates is entirely wrong," he said. Over the years, the government agency that oversees insurance for occupational diseases compensated only three semiconductor cases. The agency requires a clear link to the work environment be demonstrated, which was nearly impossible for Samsung workers, partly because the company did not disclose all the chemicals it used. Another four cases succeeded in overturning the government agency's rejection at courts, including Hwang. Until mid-2014, workers had to fight not only the government agency that was a defendant in lawsuits but also Samsung's lawyers who aided the government agency. Campaigners believe an external organization with powers to halt work at Samsung factories, where there are no labor unions to speak up for workers, is the best way to minimize health risks in the semiconductor industry. But the latest developments, they say, are shutting the door to accountability. "It looks like things are back to square one," said Son.